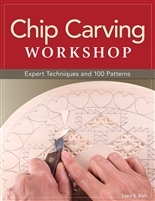 Chip carving also known as spoon carving or "Kerbschnitt" is the ideal introduction to woodcarving for beginners. This simple traditional carving method uses just a few basic knives to remove selected chips of wood in small triangles squares and free-form curves producing amazingly intricate and delicate results. Nationally known woodcarving artist and author Lora S. Irish shows you how to get started in this venerable craft. Chip Carving Workshop takes you through all of the essential chip carving techniques from tool sharpening and preparation to hand positions chip cutting and finishing. You'll discover how to use both geometric shapes and free form designs to create wonderfully detailed patterns. Practice projects will have you decorating household items and creating artistic pieces in a variety of original designs. Hope chests wooden spoons jewelry chests clocks candle plates serving trivets and decorative plaques are just a few ideas for your new chip carving skills.